With the 2012 Presidential Election campaign already heating up, how do we handle the increasing partisan unwillingness to find common ground in making national policy? How do we fix the broken political system? In an intimate setting over lunch, former Governor Whitman will tackle these questions and more. 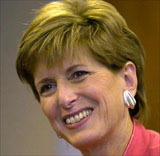 Governor Christine Todd Whitman serves as co-chair of the Republican Leadership Council (RLC), which she founded with Senator John Danforth. The RLC’s mission is to support fiscally conservative, socially tolerant candidates and to reclaim the word Republican. The RLC was created in March of 2007 by joining forces with Governor Whitman’s political action committee, It’s My Party Too. She is the author of a New York Times best seller by the same name, which was published in January of 2005 and released in paperback in March 2006. As Governor, Christie Whitman earned praise from both Republicans and Democrats for her commitment to preserve a record amount of New Jersey land as permanent green space. She was also recognized by the Natural Resources Defense Council for instituting the most comprehensive beach monitoring system in the nation. As EPA Administrator, she promoted common-sense environmental improvements such as watershed-based water protection policies. She championed regulations requiring non-road diesel engines to reduce sulfur emissions by more than 95 percent. She also established the first federal program to promote redevelopment and reuse of “brownfields”, that is, previously contaminated industrial sites. Governor Whitman is on the Steering Committee of The Cancer Institute of New Jersey; the Board of Trustees of the Eisenhower Fellowships; the Board of Directors of the Council on Foreign Relations; the Governing Board of the Park City Center for Public Policy; and is a member of the Board of the New America Foundation. She was also the Co-Chair for the Council on Foreign Relations’ Task Force, More Than Humanitarianism: A Strategic U.S. Approach Toward Africa as well as the Aspen Health Stewardship Project, which was released in February of 2008. She co-chairs Clean and Safe Energy (CASE) with Dr. Patrick Moore.